Smart strategies for an inclusive school year. Visit the Brookes Inclusion Lab Blog for more articles and ideas on creating classrooms to meet the needs of all of your students. Go Now More articles in this campaign. When teachers find out they’ll have a student (let’s call him “John”) with complex support needs, they want to help. But they also have questions. A student like John may have an intellectual disability, Down syndrome, physical disabilities, autism, or combined hearing and vision challenges. Here are the most common questions and concerns that Cheryl M. Jorgensen, PhD, an inclusive education consultant, has heard during her 33 years in the field. Dr. Jorgensen shares her best inclusion strategies below. You can also get some tips from Cheryl in the video below. First of all, you’re going to love this kid (Kluth, 2012)! If you are a good teacher for typical students, then it’s likely that you’ll be a good teacher for John. Try to focus on the basics during the first couple of weeks. Make sure John has a seat right among his classmates, perhaps at the front of the room. Assign him to the same classroom jobs and roles as you do other students. Ask for help from his IEP team members to make your classroom physically and sensorially accessible. Most importantly, remember you are not alone on this journey. I suggest you talk with your principal and special education director about how they’ll support the student’s IEP team. Ask for their help in scheduling a weekly one-hour meeting when you’ll plan for the supports that your student needs. I’ve found that when IEP teams have a paid planning day just prior to the start of school in the fall, they can establish some team norms and plan out the first few weeks of class. It’s also important for you and the rest of the team to clearly outline each person’s responsibilities, talk about the student’s learning style and review his IEP, set up a schedule of team meetings and time when team members will be coming into your classroom to help support the student, and discuss grading. It’s also a good time to reach out to the student’s parents/caregivers and invite John and them to tour the classroom and get an idea of their hopes and fears for the year. 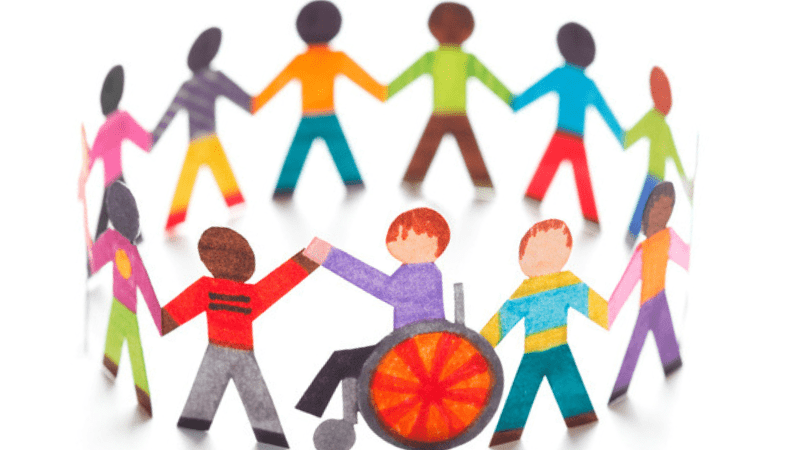 Although you need to follow confidentiality rules regarding the disclosure of students’ disabilities, there are definitely some things you can do to create a culture of inclusion in your room. Rather than doing the traditional disability awareness activities you may have heard about—where typical students try writing with their nondominant hand or try to navigate the classroom while wearing a blindfold—I recommend that you do some activities that make differences ordinary. To ask typical students to mimic having a disability discounts the lived experiences of people with disabilities themselves. A great start would be to have all students create and share a presentation about themselves describing their interests, hobbies, learning styles, family backgrounds, and the like. Students can create a poster, do a PowerPoint or Prezi presentation, or even write a poem about themselves. Send a note home to John’s parents/caregivers letting them know about this activity and let them decide how much they would like John to share about his disability. Rather than setting up a buddy system just for John, use collaborative learning structures to emphasize that all students sometimes need help and all students have something to contribute. First, remember that “not being able to speak is not the same as not having anything to say” (Crossley, 1990). Here’s where John’s speech-language pathologist (SLP) can help you understand how you can communicate with John and how you can support John to communicate with you and his classmates. Some students who don’t speak have assistive technology devices programmed with communication apps—they press a button, and the device speaks aloud. I suggest that John’s SLP do a mini-workshop for you and the students about how to be good communication partners to John. To encourage John’s communication, wait time is really important (count to ten slowly to yourself after asking a question). Also, try to use nondirective questions—such as, “Tell me about your day,” or “What is your opinion about … ?”—rather than questions that just require a yes or no answer. If you find John doesn’t have a way to participate in classroom discussion or to show his knowledge, then it’s time for a team meeting and perhaps a formal communication assessment. Honestly, I would advise that you don’t place any stock in John’s IQ score. IQ scores for students with disabilities have been criticized for many reasons. How can one number truly represent a person’s capacity? IQ scores account for only 40 to 50 percent of expected achievement. And for any given IQ test score, half of students will attain achievement scores at or above that score (McGrew & Evans, 2004). Furthermore, I’m sure that you know about the power of teacher expectations; you have probably had many students over the years who have risen above low expectations, and I suspect that John will also surprise you. I recommend adopting the least dangerous assumption and presuming that John is competent: That is, if he receives quality instruction and the supports that are documented on his IEP, he can and will learn some general education academic knowledge and skills as well as master his IEP goals (Donnellan, 1984). And finally, don’t hesitate to differentiate your question asking for all of your students. Some students’ depth of knowledge is less developed than others (not necessarily John), so ask those students to recall and reproduce information. Other students are ready for questions that require higher-level thinking. Some students with disabilities only need to have instructional materials adapted slightly in order for them to access them. These adaptations might include increasing the font size, creating more white space between words and lines, or using highlighting to indicate where to find key information. John may need to have modified instructional materials. Although there are hundreds of great resources for adapted grade-aligned materials, a favorite of mine is called Newsela. On this website you’ll find hundreds of articles at a variety of lower reading levels in the areas of math, social studies, ELA, and science in addition to great teaching tools such as quizzes, annotations, writing prompts, and power word vocabulary lists and definitions. To find a modified version of classic literature, just Google the name of the book plus the words “adapted” or “modified.” For example, here are the results of a search for adapted versions of Romeo and Juliet. John may also need to have some of his texts—novels, handouts, worksheets—enhanced with symbols or photographs. John’s SLP or OT can help make those adaptations to assure that John has access to the same information as other students in your class. Grading depends on John’s IEP. If he’s expected to master the same learning objectives as other students in your class, then you would grade him on the same standards as other students. If John’s academic learning objectives are modified or based on alternate achievement standards, then you will create an adapted grading rubric for him. In the case of the latter situation, typical students in your class might be asked to name and give the atomic number of the first 20 elements on the periodic table, and John’s learning objective might be to master the first five elements. You grade him based on the percentage he gets right. When you have your weekly team meetings, you’ll discuss the most important things you want John to learn in an upcoming unit and then base your assessment and grading plan on his personalized learning objectives. I do encourage you to give John a report card in addition to progress reports on his IEP goals. If John has a 1:1 paraeducator assigned to him, then her role is to enable John to fully participate in academic instruction and social interactions. A red flag is if you observe her “attached at the hip” to John and even serving as a barrier to your interactions with him or his interactions with his classmates. You and John’s special educator should establish the paraeducator’s role in your classroom, but ultimately, she is there to help you help John be a valued and active participant in your classroom. Under your and other team members’ supervision, she might help make adapted materials, sit next to John to support his communication, and ensure that classmates speak directly to John and not to him through her. There are so many resources for inclusion strategies and tips available for teachers! Here are a few of my favorites. Watch: Including Samuel and Intelligent Lives, films by Dan Habib. Carter, E.W., Cushing, L.S., & Kennedy, C.H. (2009). Peer support strategies for improving all students’ social lives and learning. Baltimore: Paul H. Brookes. Causton-Theoharis, J. (2009). The paraprofessional’s handbook for effective support in the inclusive classroom. Baltimore: Paul H. Brookes. Jorgensen, C. (2018). It’s more than “just being in”: Creating authentic inclusion for students with complex support needs. Baltimore: Paul H. Brookes. Kluth, P. (2012). You’re going to love this kid! A professional development package for teaching students with autism in the inclusive classroom. Baltimore: Paul H. Brookes. Nelson, L.L. (2014). Design and deliver. Planning and teaching using universal design for learning. Baltimore: Paul H. Brookes. Tashie, C., Shapiro-Barnard, S., & Rossetti, Z. (2006). Seeing the charade: What we need to do and undo to make friendships happen. Nottingham, UK: Inclusive Solutions. Crossley, R. (1990). Not being able to speak [Poster]. Syracuse, NY: Syracuse University Center on Human Policy Press. Donnellan, A. (1984). The criterion of the least dangerous assumption. Behavioral Disorders, 9, 141–150. McGrew, K.S., & Evans, J. (2004). Expectations for students with cognitive disabilities: Is the cup half empty or half full? Can the cup overflow? Minneapolis: University of Minnesota, National Center on Educational Outcomes. Posted by	Cheryl Jorgensen, Ph.D.